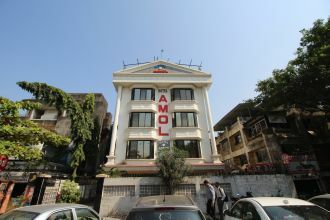 Hotel Amol, a budget hotel in Navi Mumbai is situated approximately 40 minutes from the airport and about 10 minutes from the railway station. Each of the 23 rooms designed with contemporary taste and style offers a satisfying stay to the travelers. Shri Swasthik, a unique fine dining restaurant serves specialized Indian bread and variety of Tandoors, Continental, Italian and Chinese delicacies. The resto bar also offers the best of wines, spirits and beers to unwind.